Age 17 had anxiety, negative thoughts and memory loss. Weight gain, acanthosis and menstrual irregularities. At 17 to psychiatry, gynaecologist and 2 more endocrinologists finally arriving at diagnosis after cortisol and ACTH tests followed by dexa suppression and CT abdomen. She was operated laparoscopically and is now 7 mths postop. She is off steroid supplementation and is improving steadily. I WISH THERE WAS MORE AWARENESS ABOUT THIS DISEASE !! 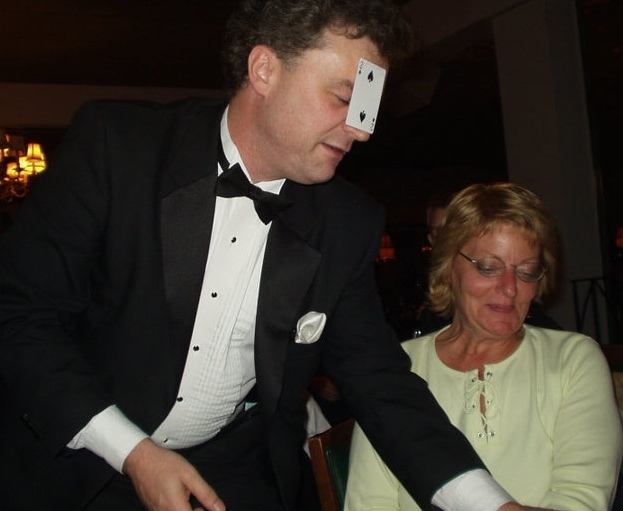 Portland, OR, Cushing’s Conference, October 2003, Day 2, at a “House of Magic” dinner. Portland, OR, Cushing’s Conference, October 2003, Day 3. 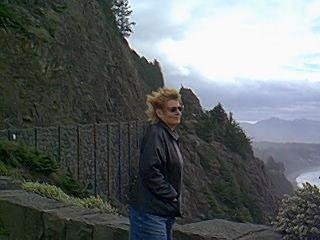 It was very windy on the Oregon Coast! Diana Lynn Alexander Crosley, age 58, of Sidney, passed away peacefully on Wednesday, June 18, 2014, at 10:10 p.m. at her residence surrounded by her loving family. She was born September 30, 1955, in Sidney, the daughter of Francis Alexander, and the late Laverne Egbert Alexander. 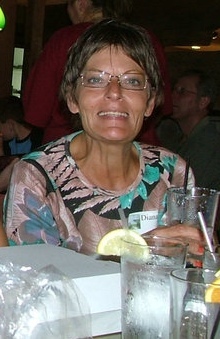 Diana is survived by her father and step-mother, Francis and Carole Alexander, of Sidney; daughters, Stacie Crosley, of Columbus, Casey Crosley, of Silver Spring, Maryland, Ericka Crosley, of Sidney; one granddaughter, Ella Laws, of Sidney; two sisters, Kathy and Randy Watercutter, of Minster, and Susan Alexander, of Mt. Vernon, Missouri. 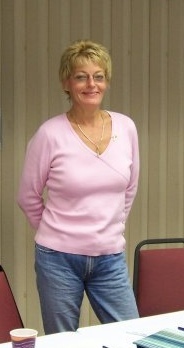 Diana was a 1973 graduate of Anna High School. She was a registered nurse for many years. In her spare time she enjoyed meditating and doing yoga. She also enjoyed relaxing at the beach in Florida. Her family, her children and especially her granddaughter, was the love of her life. She will be deeply missed by all. The Crosley family would like to express their sincere thanks to Ms. Lisa Blagg and the entire staff of Wilson Hospice for the continued compassionate care of their mother during her extended illness. Funeral services will be held on Saturday, June 21, 2014, at 3:00 p.m., at the Adams Funeral Home, 1401 Fair Road, Sidney. Family and friends may call from 12-3 p.m. on Saturday, prior to services at the funeral home. Memorial contributions may be made to Wilson Memorial Hospice in Diana’s memory. Envelopes will be available at the funeral home. As with everyone who suffers from this disease, mine is a rather long story. In retrospect, I believe I became symptomatic sometime around 1994. Particularly, I remember the weight gain and facial hair. I was also somewhat depressed, but at the time I was in an emotionally and physically abusive relationship and had a lot of “on the job stress” in my position as a psychiatric nurse, working for an HMO. In addition, my grandmother was ill, I turned 40 and I attributed most of my problems to “life” In 1995, I accepted a job transfer from Dayton, Oh to Birmingham, Al. My grandmother had died and I needed to get away from the relationship. Unfortunately, the office in B-ham closed after approx 18months and I accepted a position as RN/Medical director at a residential facility for children with autism, seizure disorders and behavioral problems. At this point my blood pressure skyrocketed, the slightest scratch or bump would result in a major hematoma and skin tear. I had a cardiac work-up and was told I had ischemic tissue in my left ventricle and was sent to Houston for a cardiac cath. Ok this part’s kind of funny, now of course at the time I couldn’t believe it. If anyone’s familiar with Houston, you know how terrible the traffic can be. I arrived for the cath, at 8am I was prancing like a wild animal in my room as I waited for the nurse to bring me my “sedative” At approx 11:00 she came in and began to take my vitals. Almost simultaneously, she was paged, returned to my room to tell me that the cardiologist had broken his tooth while eating a muffin for breakfast and all his procedures for the day were cancelled. I had to reschedule. Thankfully, when I did have the cath, he told my my heart” was beautiful” When I asked about the results that said I had dying tissue he replied “Oh, that must have been a blurp on the film”. Moving on, even though my heart was fine, I had now regained all of the weight I had lost and was in constant pain. I then moved to Florida to stay with a friend’s mother, who had suffered a stroke. I began working per diem as a Home Health RN. I kept getting worse in all areas. I went to a doctor in Fl. who told me I was depressed and getting older, ergo all my problems. He told me that the buffalo hump was a fatty lipoma and referred me to a surgeon to have it removed. I went to a surgeon for a consult, was scheduled for surgery and my COBRA ran out on my insurance and I couldn’t afford to continue it. I then went to a plastic surgeon, who confirmed it was a fatty lipoma, of course One of the biggest he had ever seen. He even photographed it to use for teaching seminars. And don’t you know, it grew right back. I spent 1700.00 (on credit) and it came back. At this point, I was having trouble standing, sitting, lying down. I was in constant pain and was having a lot of problems just trying to do my job. I went to another physician who thought I was depressed and maybe had leukemia because my lab work was all screwed up. Here again, the bad news was I was dying but it might take twenty years for the leukemia to kill me. At this point, I was ready to hang it all up. Then, in Aug of 2001, I had just seen my last patient and was on my way to the office to complete the paperwork when a young man did a U-turn and t-boned me on the driver’s side. This just about put me over the edge, however, again, on the bright side, I went to a chiropractor, whom I had been seeing, and she ordered an MRI of my back. The MRI also, incidentally, revealed massive bilateral, adrenal hyperplasia. I contacted the Nurse’s Endocrine Society. They sent info on Cushing’s. I could not believe the sketching of the women with Cushing’s it looked just like me. I also fit the symptom profile, almost completely. I was referred to an endocrinologist in Melbourne, FL. He did the 24-hour urines and dex test, confirmed the diagnosis, I was already convinced. He contacted the NIH as I didn’t have health insurance. I had a bilateral adrenalectomy (right side laproscopically and open left side as I began to bleed) Jan 17, 2002. I was discharged on Jan 26th. I came to Ohio to stay with my daughters while I recovered, never thinking in my wildest imagination that that process would be so lengthy and utterly miserable. I hurt everywhere like I had never hurt before. I developed a serious sinus infection I went back to Florida in Feb. I stayed with friends. I applied for disability, I hoped for a worker’s comp settlement for my back injury. The insurance company who was handling my claim filed Chap 11 and all pay outs were suspended. They did pay for some physical therapy. There contention is that it was the Cushing’s that was my major problem and not related to the accident, however, duh! They’re right, but because I had the Cushing’s the injury I incurred in the accident was more severe than the average person would have sustained. When I went to the NIH in Jan the chest X-ray revealed multiple healing rib fractures which were most likely a result of the accident. So, I’m still awaiting word on my disability, I was denied, appealed, denied again and am waiting for the hearing. In the meantime, my car was repossessed, I will most likely have to file bankruptcy and am now staying with my oldest daughter in Columbus. It has been one year since that surgery and I guess my expectations were that if I kept trying to be patient, get through this year things would be back to a semblance of normalcy. OK I know I’m wordy. Thanks for the support and I would welcome input from anyone. Anyway, the first five yrs post BLA were painful and traumatic but also a blessing. In 2005 I started taking yoga classes and that was the beginning of an amazing transformation for me. It led to meditation and an exploration of the spiritual meaning of this illness and of life in general. Of course the transformation wasn’t immediate and it is ongoing but I feel so blessed to be experiencing this life. I’ve learned to be grateful for the gifts of all of my experiences. Without Cushings, I never would have met some of the most caring and amazing people on this earth. In July of 2008 I returned to Florida. I am now living in a little beach town, bought a bicycle and ride it almost every day. I still have pain, but it’s manageable and I focus on my breath and gratitudes as a way of managing it. I’ve learned the value of positive thoughts and intentions. I’ve learned that we are all more powerful than we may have ever imagined. I’ve met some amazing people here and continue to read and attent seminars and classes on exploring my purpose in this life and the gifts I have to give to the universe. To all who are just beginning this Cushing’s journey, and for those experiencing the feeling of “no light at the end of the tunnel” -the light is there, just waiting for your arrival. You can and will get through this, your life is not over. I am 38 and had three transphenoidal surgeries for Cushing’s. I had a CSF leak with the 2nd and when they went in to repair it and look for more tumor my remaining pituitary gland was necrotic and I lost the whole gland. That did not cure my Cushing’s so I went on to have a laproscopic adrenalectomy followed quickly by galbladder problems and appendicitis. Dr. Ludlan, Deleshaw and Sheppard at OHSU worked with me. I had my pituitary surgeries in 03 and my adrenals and other 2 surgeries in 04. I have not been able to return to work as a nurse and feel thie surgeries have greatly reduced my quality of life. I would love tro talk with other people. I have two adopted kids from China as a single mom who are 12 and 13. I know have problems with fibromyalgia and arthritis. Hi my name is Liz and I underwent a laparoscopic adrenalectomy 5/9/12 to remove my 3cm tumor that was releasing high doses of cortisol causing cushings syndrome for what I believe has been about 3-5 years now. I was diagnosed with PCOS about 5 years ago so everytime I went to a Dr. complaining of my symptoms they blamed it on the PCOS and stress and sent me home. I knew there was something else wrong, the symptoms didn’t add up, my face would get SO red it was embarassing, I would sweat through my clothes 2-3 times a day, my face became puffy, I would gain weight despite healthy eating and working out like crazy, I was anxious, depressed, I never slept, it didn’t add up. Luckily I am a physician assistant and remembered learning about cushings briefly in school. I read that most tumors were in the pituitary gland so a year ago I convinced my Dr to let me get an MRI of my brain to look for this ‘tumor’ that I was sure was there. Well the MRI came back negative and I was ironically disappointed! I was so sure I had cushings but maybe I was just crazy? The symptoms continued to get worse and I just knew that I had cushings even though everyone told me I didnt because I was still petite and didnt ‘fit the picture’. I had a colleague write a script for me to check my cortisol level and it was a whopping 56. I immediately called my endocrinologist and got more testing done that week. My ACTH level came back undetectable and I got an MRI of my adrenal gland done and suprise! There was my tumor. I am getting married in August and I am so happy that I got this miserable tumor out now so I can restart my life as a normal person. No one understands unless they have cushings the severity of the disease and how much it can change and effect your life. I hope that people become more aware of the disease so it is no longer misdiagnosed and brushed off like mine was for so long. I am so frustrated with my Doctors and with myself for being so ignorant, I feel like I wasted a good portion of the best years of my life suffering with this tumor and I hope people read this and realize there is hope! Just 10 days out of surgery I feel like a whole new/better person. I am on oral hydrocortisone now until my pituitary and other adrenal gland wake back up and start producing cortisol on their own but even with the steroids I feel great, a lot of my symptoms have started to resolve since I am at a lower dose of steroids and I can’t wait to start tapering down and be completely off of them hopefully by my wedding. Only recently diagnosed after several medical issues. I had to do my own research and had someone non-medically related suggest that I might have cushings. I was in denial and then after having two others suggest it, I asked to be tested. 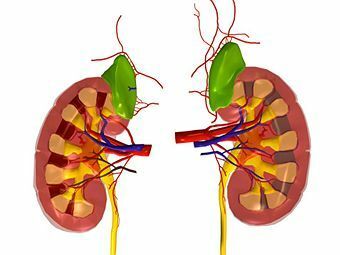 The result is that I have Cushings of the adrenal gland, I will be having laproscopic surgery on the 15th of November (2010) and have no idea what to expect. I am now 65 years old. I was first diagnosed with Cushings Syndrome in 1995 after 2 years of weekly doctor office visits stating that “my blood tests came back ok, so it must not be anything serious”. My blood pressure shot up to stroke levels daily, my hair was falling out, I gained about 8 lbs in 6 months, had the moon face, buffalo hump, etc.,etc..
Every possible test imaginable was done to find the problem except a CT scan. 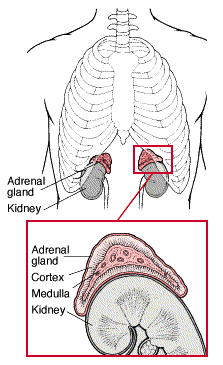 The CT scan I had (after 2 years) revealed that I indeed had a tumor on my adrenal. I went to surgery and had the tumor and adrenal removed. In fact, if I may interject, I was the “guinea pig” for the Laparoscopic Adrenalectomy performed by the doctor who invented the procedure. I was subjected to hundreds of observations while I was in the hospital for 2 days by student doctors and other Endocrinologists who wanted to see the outcome of the new procedure. Anyway, I went home after the surgery, returned to work in a week and was told I would not have to worry about ever getting this again. I have had problems of various natures since the surgery. They have not required surgery but have been very emotionally upsetting. I can not seem to lose weight no matter what I try and I have tried it all. I did lose about 50 lbs shortly after surgery but I am still overweight and cannot seem to get it off. I know my age isn’t helping but I am very physically active even with my age. My middle section is fatty, my breasts are enornous which is not a family trait, and I had had a total hysterectomy in 1994 at the age of 46 and I suffer daily with extreme hot flashes and mood swings. The hot flashes are affecting my life. I am miserable. I have talked with my doctor about the weight, hot flashes, irritability but he doesn’t think it is caused by the Cushings from before. I DO!!! I have not been to an Endocrinologist since I was diagnosed back in 1995 so I have not had my levels checked. I don’t know what to do. I’m starting to think like I did back in 1995, that this is all in my head and it’s my fault that I cannot get relief for these symptoms I still have. I do not have a OB/GYN because my old one retired. So, I am hoping that there is someone who has advice for me . I didn’t know this resource was here but I sure am glad I found you. We Have a New Bio Form!